Clara and Deanie are looking forward to being on vacation with their dad until they find out he is bringing along a girlfriend, and the girlfriend's son, John D. John D. isn't crazy about meeting the girls either, and rather than calling them by name, he refers to them as the Animal and the Vegetable. The kids do their best to avoid each other until a near-tragedy bands them together unexpectedly. Though this book has a quirky title, it's really a very straightforward story about the tension between kids who are forced to interact because of their parents' relationship with each other. What makes it stand out is the way Byars describes each character and brings each one to life in his or her dialogue. Each chapter is like a small character study in which the reader shares brief glimpses into the thoughts of the three main characters. Byars manages to inspire feelings of empathy for all three of them, making it difficult to take one side against the other. This means that the reader begins to accept friendship for the trio before the characters themselves can even imagine it, which contributes to the reader's feelings of satisfaction at the conclusion of the story. I sometimes wonder why Byars seems to solve so many of the problems in her books with tragedies. In the books of hers that I have read in the past few years, conflicts have been resolved by a drowning, a car accident, a near-drowning, a punch in the face, and a flood, just to name a few. I can't tell if Byars believes that people only change when life throws dire circumstances at them (something that feels very Southern a la Flannery O'Connor) or if she is just trying to keep things exciting by throwing in these high stakes. Either way, it's a definite pattern in her work, and it has varying degrees of success. In this book, the dangerous situation works well enough, but also I think the story could have made its point just as well without putting a character in that situation. 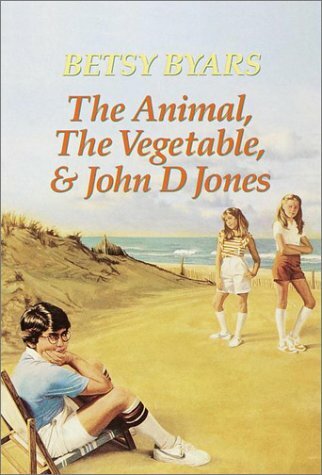 Compared with Goodbye, Chicken Little, The Animal, the Vegetable and John D. Jones was the better book, but it is by no means as original or well-written as something like The Summer of the Swans or the Blossom series. It's a solid three-star read which is dated, but which might still appeal to a 21st century kid in a similar situation to that of the characters.